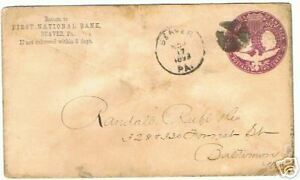 HERES A U349 ENVELOPE / WRAPPER ,,,,1893 COLUMBIAN EXPOSITION ISSUE. BEAVER NOV 17 1893 PA. BALTIMORE,MD. NOV 18 7;30AM 93 REC'D.